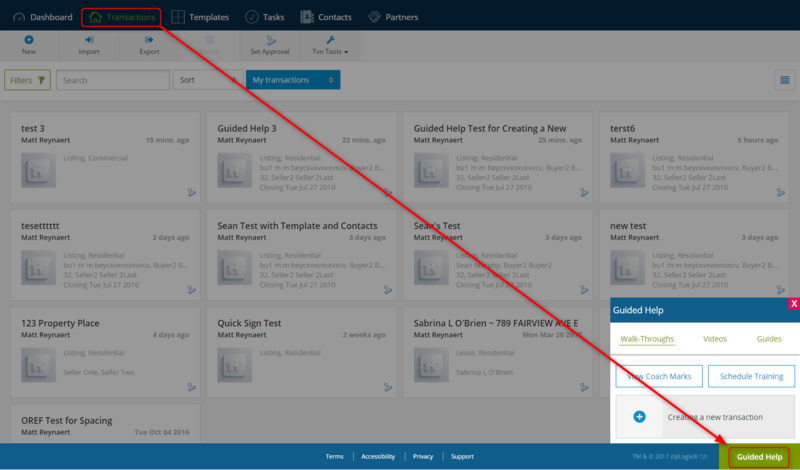 A transaction can be created with our new & improved Guided Help feature that includes an interactive walk-through, or please see the steps below. To create a New Transaction, first click “Create a new transaction” in the upper-right corner of the Agent Dashboard. 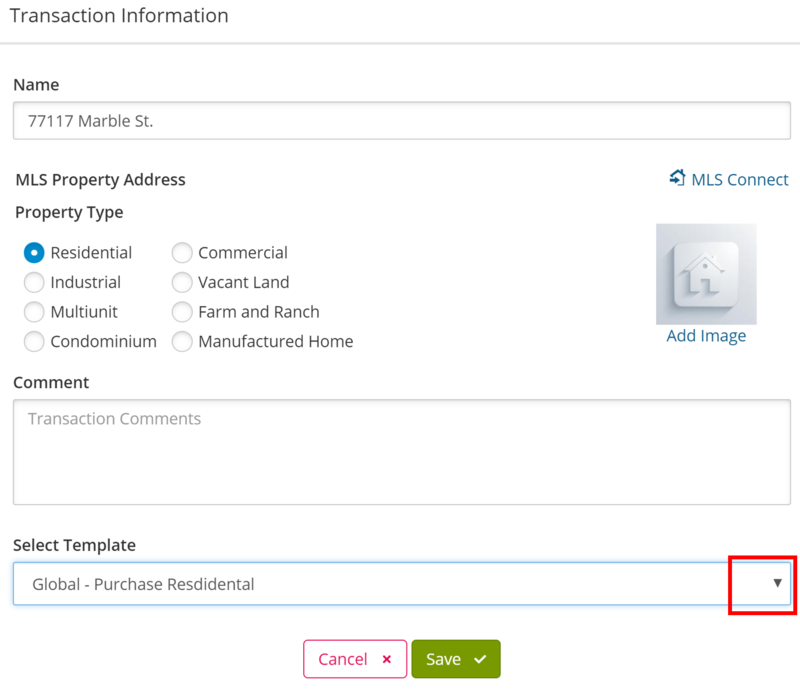 Use the “New Transaction” launch pad to select a Transaction Type. In the “Transaction Information” window, you have the option to automatically fill-in transaction information by clicking “MLS Connect” to sign-in to your account. For information on using “MLS Connect”, please Click Here. If you are not using the automated process, in the “Transaction Information” window enter the Transaction Name. In this example, the property address “77117 Marble St.” is entered as the Transaction Name. You have the option to add a photo of the property by clicking on the “Add Image” button. For information on adding a property photo to a Transaction, please Click Here. You have the option to enter “Comments” related to the transaction. 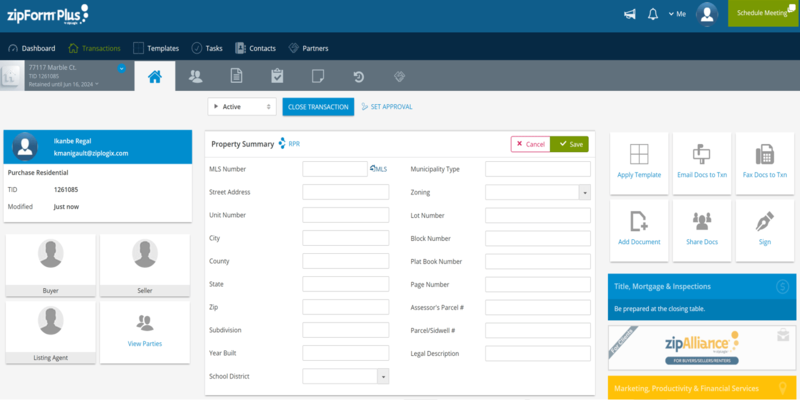 You have the option to add a Template to the Transaction using the “Select Template” drop down menu. (Templates must already be created in order for them to appear in the drop-down menu). For information on how to create a Template, please Click Here. Clicking “Save” will launch you to the Transaction “Summary”, which is comprised of various sections to help you see, at a glance, important information related to your Transaction. A partial view of the Transaction Summary is shown below.